Therapy and growth are best achieved by treating the whole person with an effective mind-body approach. This philosophy is based on the significant body of research that supports the idea that the “therapeutic alliance” is the factor that contributes most to positive change in the therapeutic process. This “alliance” is referring to healthy, trusting relationships. This begins with employing the right people, and training them effectively in the process of building and maintaining these relationships with our clients and families. This is consistent with our philosophy that “people, more that programs create the most lasting impact.” This philosophy continues with our focus on creating a therapeutic culture among the teams of girls at Solstice. It is within this culture that our students learn about and experience healthy relationships with both peers and adults, which form the foundation for the development of healthy relationships in their future. It is in this caring, safe, therapeutic culture that healing and growth are most effectively facilitated. While “compliance” is often the first expectation in promoting and measuring change, this is often misguided, and fails to promote lasting change. Compliance that springs from external controls and “fear of punishment” tends to be short lived, so that when the external controls are removed the “change”, departs with it. A principle driven approach gets to the heart of motivation and becomes the catalyst that not only inspires change, but is the key to maintaining change over the long term. Learning to identify and develop your own core principles and values and allowing them to govern your actions and decisions is truly what results in a commitment to change. A desire to identify with, adopt and nurture desirable qualities like respect, responsibility, love, family relationships, and personal responsibility are common principles and core values adopted by girls in the Solstice program. These and many other core principles are identified, chosen, developed, and adopted by each girl and are ultimately what inspires the intrinsic, lasting change that reunites healthy families. Due to the developmental stage of adolescence, most teens learn more effectively by “doing” than by “talking” about doing. 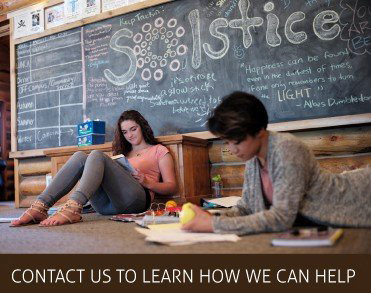 While we do plenty of “talk therapy” at Solstice, we underscore, reinforce and emphasize important therapeutic principles and ideas through therapeutic activities known as experiential therapy. Equine therapy, experiential groups, recreation and adventure therapy, community service activities and other interventions are used to teach and reinforce important ideas that contribute to the growth and healing process. 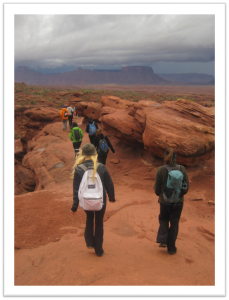 Experiential therapy is a vital part of any teens healing process as it promotes learning through additional areas of the brain, thus refining and solidifying changes necessary in long term wellness. Unlike other trauma treatment centers, we define trauma more broadly than has typically been done historically. Recent neurological research has provided insight and support in developing the most effective treatment methods for trauma as it has helped us to better understand the impact of trauma on a developing, adolescent brain. Historically, trauma was typically used to describe the impact of large-scale catastrophic events such as natural disaster, wartime violence, severe bodily injury, or severe forms of physical or sexual abuse, now referred to as “big T’s”. Further research has shown that what might be considered “less severe” incidents can have just as significant negative impact on the brain in terms of neurological effects. Some common trauma’s, referred to as “little T’s, that can have major impact include divorce of parents, death of a loved one, or other losses, being bullied, or other forms of social rejection. While some of our girls have been victims of “big T’s”, we have found that many more of them are often as significantly impacted due to higher sensitivity, or susceptibility to “little t’s” These events often result in levels of emotional dysregulation that exceed their peers in both frequency and intensity. Then, of course, this results in girls seeking relief in unhealthy and destructive ways. As one of the leading trauma treatment centers, our efforts are aimed not at the symptoms, or acting out behaviors, but at healing the core of the problem, which is often hidden and highly complex. Let us drive the process of healing and growth for your loved ones. Sarah’s story of success shows why Solstice works.